A stroll around one of the smallest National Parks of Canada, Point Pelee and an encounter with a few of the locals - geese, snakes, birds, and turtles. Point Pelee National Park, Ontario. Since we were heading so far southwest, a visit to Point Pelee National Park was also factored in since it was on the way to the city of Windsor - kinda. The park plays host to an array of wildlife species and is an important stop over for migratory birds, making it a birders paradise! There are many walking trails in the park through lush Carolinian forest, or onto sandy beaches which fringe Lake Erie. 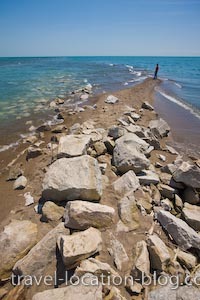 Point Pelee is one of Canada's smallest National Parks but it's big on natural wonders. The bottom tip of Point Pelee National Park which extends out into Lake Erie is the southernmost point of mainland Canada. It is constantly changing and moving according to the currents of the lake. The park features over 70 species of trees and more than 20 species of reptiles and amphibians. This is not to mention the many species of insects and spiders. Birder's flock to Point Pelee for the spring and fall bird migrations. During the Spring migration, songbirds which are clothed in their brightly coloured plumage sing out noisily, whereas in fall when their plumage is dull, they are less boisterous and more relaxed. During our brief visit to Point Pelee National Park we were pleased to see a small sample of wildlife such as Canadian Geese parents tending their goslings, snakes sliding effortlessly through the water near the marsh boardwalk, and turtles sunning themselves on the muddy flats - this place is teeming with life! Southernmost point of Mainland Canada at Point Pelee National Park, Lake Erie, Leamington, Ontario, Canada.